Bank of America sponsored a gun-control discussion, hosted by Axios, on Friday. 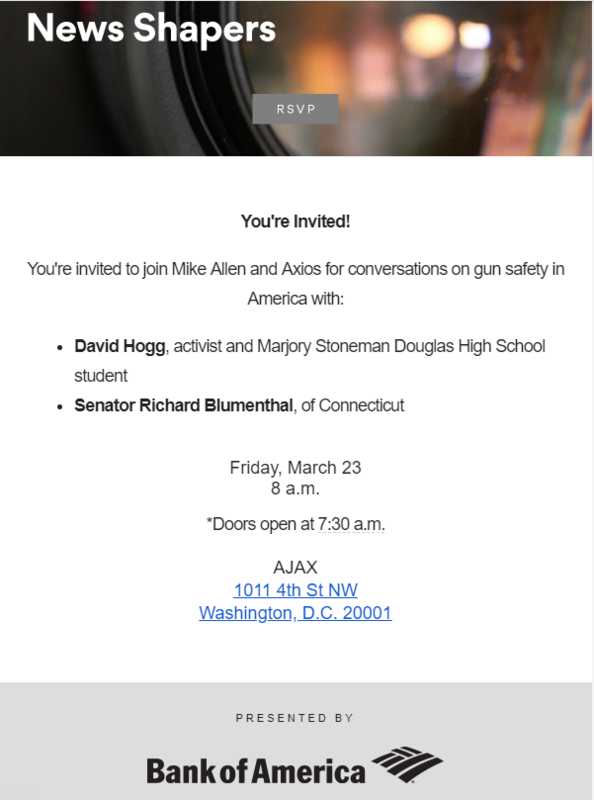 Axios co-founder Mike Allen facilitated the talk between activist and Marjory Stoneman Douglas High School student David Hogg, Democratic Sen. Richard Blumenthal of Connecticut, and Larry Keane of the National Shooting Sports Foundation, a group that represents the firearms-industry. The event, held in Washington, D.C., occurred at 8 a.m. and had no outside sponsors beside BoA. On Wednesday morning, it was billed as a conversation “on gun safety in America,” featuring gun-control advocated Blumenthal and Hogg. A Wednesday morning invitation to the discussion. By Thursday, Keane had joined the panel. BoA was one of the earliest financial institutions to signal its support for gun-control measures following the Parkland shooting. The bank said in February it would ask its clients who manufacture so-called “assault weapons” how they plan on helping to end mass shootings. “An immediate step we’re taking is to engage the limited number of clients we have that manufacture assault weapons for non-military use to understand what they can contribute to this shared responsibility,” read a statement from the bank. Correction: This article has been updated to reflect that Larry Keane, a representative for the firearms industry, joined the discussion. An earlier publication highlighted the previously advertised pro-gun-control speakers and did not include the firearm industry’s representation on stage.